When the entire country gets revenue from tourism, Kalimpong is no far from the scene, it gets many tourists from March-June and from September to December adding benefits to the economy of the town. Leaving the eco-tourism spots aside, the old and famous Delo tourist lodge makes a positive turnout with the added embellishments in the location. The golf cart was recently added to attract more tourists which is now destroyed and abandoned. The Villa doesn’t permit a tourist vehicle inside the gate which leads towards the lodge but the golf cart near the gate was a good transporter for the old-aged people who paid 50 rupees till the lodge’s entrance. ‘The seven-seated cab used to encircle the lodge in 50 rupees,’ (per head) said the source. The battery car was sponsored by the GTA to the uplift Darjeeling tourism three months ago which has now been lying uselessly in the garage since last 15 days. The car owned by ‘Prevalence green solution’ the renowned company of Bangalore has no on-hand mechanic here which is one reason for the cab to remain inactive in the garage. 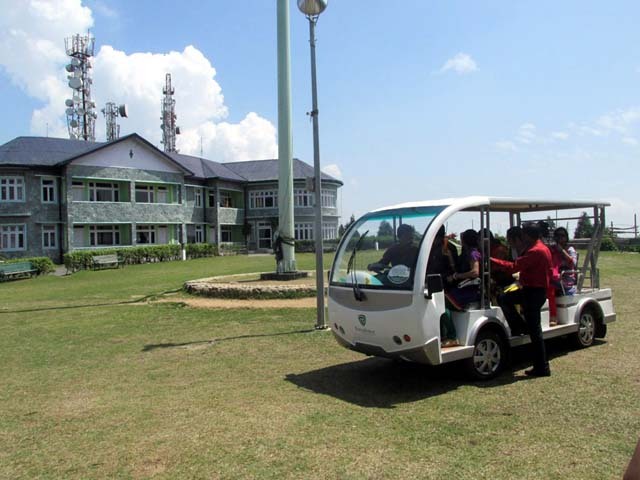 Speaking about the servicing of the cart, Nima Tshring, one of the staff of Delo tourist lodge told that the concerned authority has been informed about the state of the cab. ‘After the car stopped functioning, we immediately informed Sonam Bhutia-the secretary of tourism department, he assured us that the mechanic of Prevalence green solution will be brought here immediately’ said Tshring, adding that the company has been informed as far as he is concerned. The driver of the golf cart was also not available to give details of the deadlock eco-friendly car. Ironically, the gearing tourism has somehow hindered with little reluctance in the hills, believes a Hoogli born tourist, ‘I visited Darjeeling before this, it is congested and little dirty as compared to Kalimpong, but I think Kalimpong has to work more on the roads, its clean and peaceful here but the roads are bad’ said S.P Das who boarded from Hoogli. With the statements or feedbacks received from the tourists it can be assumed that they are little unsatisfied with the standard of tourism in the hills. Das also suggested for minute maintenance in the fluctuating electricity and to give a serious attention to the water problems in the hills. 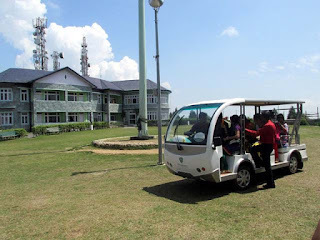 Battery car stops function in Kalimpong Delo - The battery car was sponsored by the GTA to the uplift Darjeeling tourism three months ago which has now been lying uselessly in the garage since last 15 days.